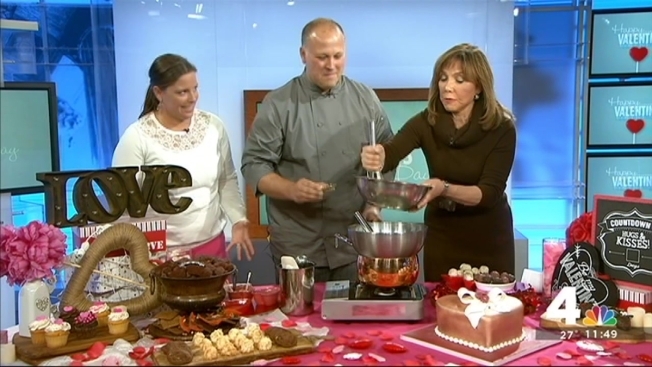 Jim and Melissa Benson from Eleven Courses Catering share some easy Valentine's Day ideas. Instructions: Whisk together the softened cream cheese, condensed milk, coco powder and honey. Crush up the vanilla wafers (save 3 tablespoons for garnish) and fold in your cream cheese mixture. Stir in espresso powder, cinnamon and lemon infused olive oil. Next form one inch balls with the mixture. Melt the white chocolate (boil 2 cups of water in a pot and place a second pot on top of the boiling water) add the white chocolate to the top pot and stir gently until completed melted. If chocolate begins to thicken, add a tablespoon of vegetable oil to thin out. Remove from heat and tip your cookie balls into the chocolate. Garnish with crushed wafer. You can also garnish/decorate with festive pink, red or white sugar! Instructions: Crush up the Oreo cookies (save 3 tablespoons for garnish) and fold in the softened cream cheese and the Eggnog. Next form one inch balls with the mixture. Melt the milk chocolate (boil 2 cups of water in a pot and place a second pot on top of the boiling water) add the milk chocolate to the top pot and stir gently until completed melted. If chocolate begins to thicken, add a tablespoon of vegetable oil to thin out. Remove from heat and tip your cookie balls into the chocolate. Garnish with crushed Oreo. Getting Too Chilly for Outdoor Fire Pit Fun? Build Your Own S'mores Bar - Indoors! Getting Started: For the "Bar" all you need is a (shallow) wooden box, some rocks (easily found in craft stores like Michaels) and a few sternos (gel works best!) Fill the box with rocks and place the sternos inside the box (surrounded by the rocks.) Lite your sternos grab some marshmallows (or make your own...see below! ), some toasting sticks and your favorite s'mores fixings and you can enjoy this sweet treat all year round! The marshmallows: Homemade marshmallows are easier to make then you think. Try unique flavors like Rose Water, Orange Creamsicle, Mango or Lemon. The chocolate: Get creative with different chocolate combinations that you can easily infuse at home. Take a look in the pantry and try different combinations of sweet and salty, play with textures and spices - anything is fair game! Choose a high quality milk or dark chocolate bar and melt down over a double boiler and make your own infusion. Pair with a classic marshmallow, or a fun flavored one; our house favorite is candied ginger and lavender with a splash of black vinegar, paired with a mango marshmallow. The slight bitterness of the vinegar and sour edge to the ginger balances out the fruity sweetness of the marshmallow, the crystalized lavender adds the perfect amount of popping color and texture. The graham crackers: Stock up on regular (honey), chocolate and cinnamon crackers, so that you will always have the perfect foundation for any s'more you make. "I love the crunch of the banana chip and spice of the yellow curry embedded in a rich dark chocolate. The banana chip is super sweet and stands up nicely against the starkness of dark chocolate; the curry adds in depth and is very aromatic against the rose water marshmallow. The chocolate graham cracker is less buttery then the classic honey and keeps the s'more layered with clean lines and flavors." "This is a really fun and unexpected combination. You taste the classic duo of lemon and mint first and then there is a pretty intense heat that comes from the white pepper that hits you at the back of the throat and cuts through the sugar oozing from the marshmallow. The poppy seed adds a hint of nuttiness that gives the s'more a complex finish." "What I love about this combination is that it is just really simple - cardamom and milk chocolate with an orange creamsicle marshmallow. The rich earthiness of cardamom gives the chocolate such a full flavor, it doesn't need anything else. The orange creamsicle marshmallow, is delicate and let's the cardamom shine through.